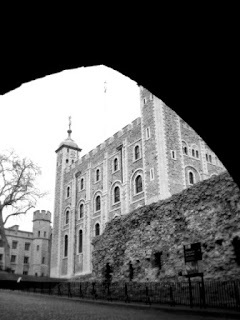 Tower of London - (c) G.K. Jakobs. A few days prior to Josef Jakobs' execution on 15 August, 1941, Lt. Col. W.E. Hinchley-Cooke of MI5 met with W.B. Purchase, the Northern District Coroner (London) and G.H. Cox, Assistant Adjutant General of the London District (military). The three men met around 10 August to discuss the procedure surrounding a coroner's inquest in the case of the death of a person in military custody. Hinchley-Cooke wanted to keep Josef's execution as secret as possible. He desperately wanted to avoid a coroner's jury and notice of the execution being posted on the gates of the Tower, both of which were necessary when a person was executed at one of His Majesty's Prisons. Hinchley-Cooke recognized that the members of a coroner's jury would need to be informed prior to the actual execution, and he wanted to avoid this at all costs. Purchase said that a coroner's inquest would be necessary because the death would be unnatural and, if the Tower of London was a prison, then the coroner would need to involve a jury. Purchase rather thought that the Tower could be classified as a prison but a copy of the Army Act was produced for him which altered his thinking. Purchase noted that "it is true that in the past [the Tower of London] has, and at times in the present it may harbour persons in custody, but it has never been set apart by the Secretary of State under the terms of the Army Act (s. 132(1)) as a military prison." The Tower of London was simply a royal palace and a fortress, not a prison. Given that the Tower was not a prison, nor a palace in which the King was in residence, it could simply be considered an ordinary place in which a person had died an unnatural death. In the opinion of Purchase, the coroner assigned to the case need not call a coroner's jury nor post a notice of the execution on the gate of the Tower. Purchase noted that the coroner would still need to conduct an inquest to determine the legality of the death and whether or not it had been carried out in the proper and humane way. Thus the coroner might choose to conduct the post-mortem examination in concert with a skilled person independent of those who had conducted the execution. Finally the coroner and whoever conducted the post-mortem could be bound by the provisions of secrecy. Hinchley-Cooke was much relieved by this decision and could relax, knowing that Josef's execution would take place in military secrecy. National Archives - Home Office file - HO 45/19086.